No white after Labor Day, how many times have we heard this? Well, I am not following that ancient rule. 2. 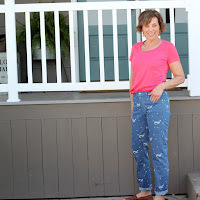 I have had this fabric since June and didn't get my white jeans made! 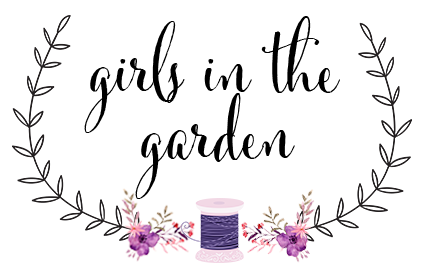 So let's start with the denim, it is Mood Fabrics' White Denim Blend and the description states cotton/polyester but it feels mostly cotton. Now this fabric has no stretch, so I sewed my side seams with 3/8" seam allowance, giving myself a bit more room. I really like how they feel and the white denim reacts like regular denim with no stretch,but it starts to give a bit while wearing. 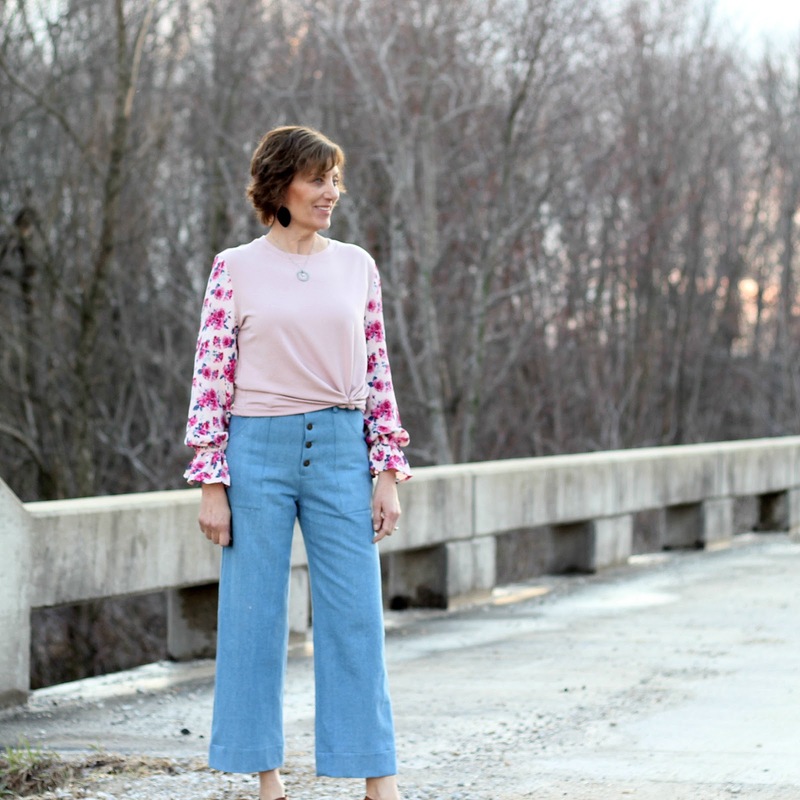 I used my Closet Case Ginger Jeans for the fifth time, one of those times is featured on my Mood Sewing Network post last January. 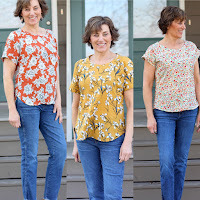 That post features most of my pattern changes. And while we are talking about my post in January, how much better is my hair now! Just goes to prove change is good. 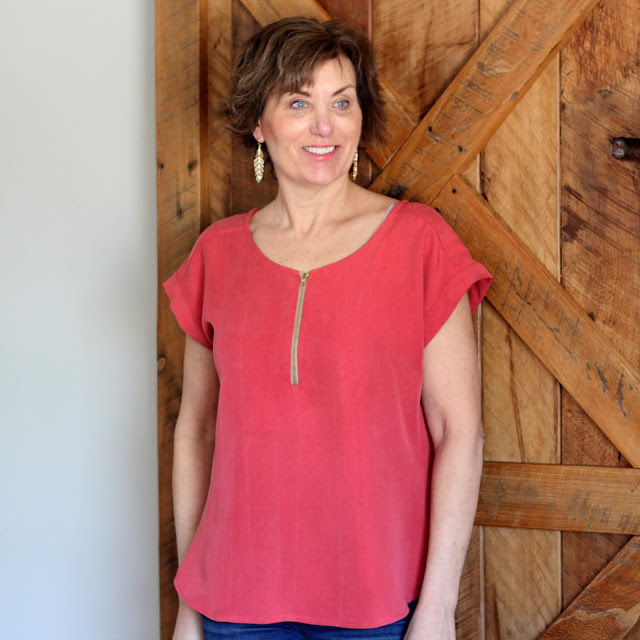 If the white denim isn't quite what you are looking for, Mood Fabrics has so many stretch denims. Another fabric, I want to use for these Ginger Jeans is a stretch corduroy. Wouldn't those be perfect for the fall and winter? I really like this geometric print, could I pull that off? A couple more changes in my jeans, I stitch the top of the waistband with a 1/4" seam allowance, this gives me a wider waistband and my jeans are a higher rise. I have always added 1" to the rise. With this change, I can add 2 snaps for the front closure. I am anxious to see how this denim wears during the day. How much stretch happens? With no lycra and recovery, will the jeans look good or bad after a long day? I am hoping good. Can you tell the time of day by my long shadow? I finished these jeans on Sunday and hurried home for pictures on Monday. Now back to the jeans and the denim. 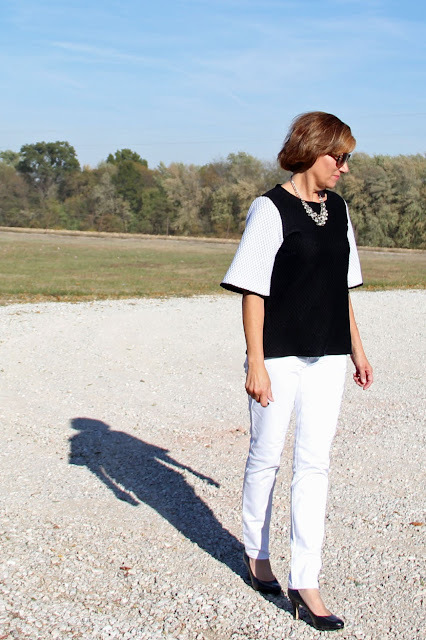 I did some research on how to wear white jeans for fall the consensus on each article was to pair it with textured tops (fuzzy knits, luxe leathers and wild knits), keeping the top dark to balance the white. 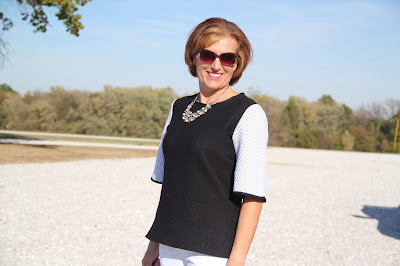 I feel my Mood Fabrics' Quilted Black/white Double Face Knit, is the perfect topper for the white jeans into fall look. 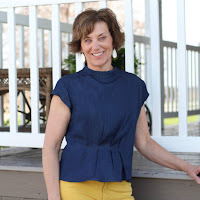 I went with the boxy top I love, Butterick 6175 a great basic for a trendy and stylish top. 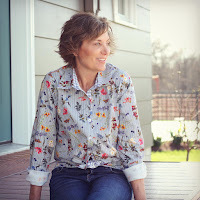 I have made it twice before, here from a Mood Fabrics' poplin and a Mood Fabrics' ponte. 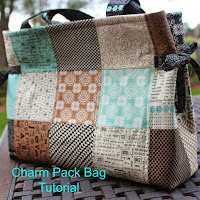 I am adding those links just to show how versatile the pattern is. I posted a picture on Instagram to ask for help.....white or black sleeves? As you can tell, the white sleeves won. This is the look I was hoping would win and I needed just a bit of affirmation. 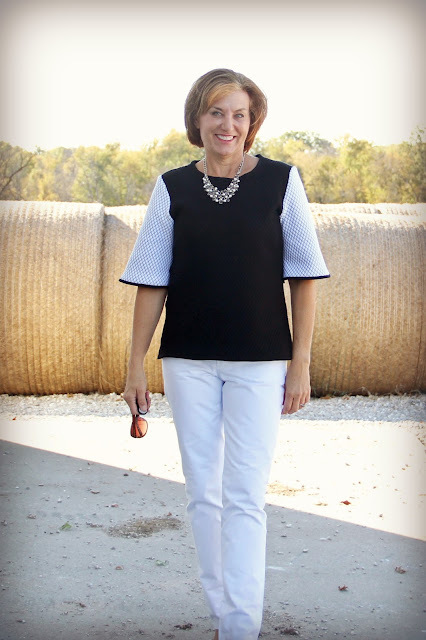 I'm so loving those white jeans and am in awe of everyone who makes a pair! These are great! 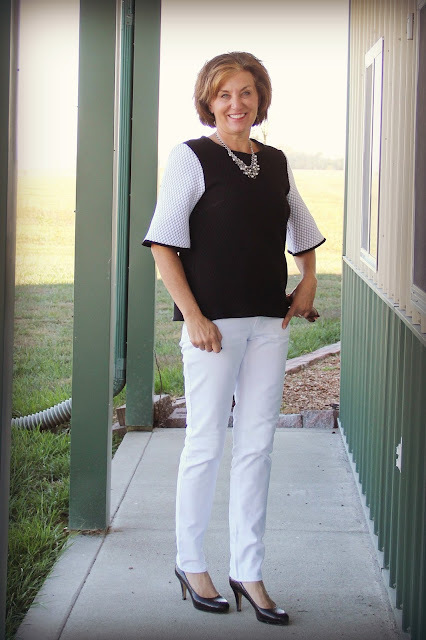 I love my new jeans and trying to work my head around wearing white after Labor Day! Oh, I am so with you, my Mother's voice in my head. If I wore those jeans with her today, she would so tell me it was wrong. You go girl! I get so frustrated when people talk about fashion "rules"! Fashion is making your own rules. 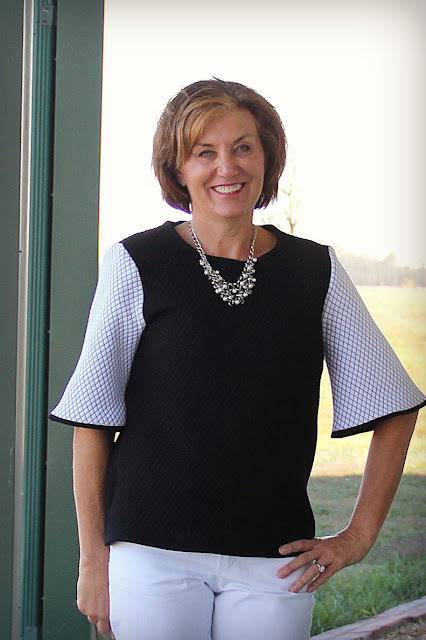 Wear what you like with confidence and you will look great. I like the way you think, your own rules is a good motto. Very cute! I really like the fabric choice for the sleeves as well-very interesting. I could not wear white pants anytime of the year unless I get rid of the Dobermans. It's not the hair, it's the noses. They just have to touch-just like kids. Thank you so much. I liked to lighten up the fabric a bit with the reversed sleeves. White jeans after Labor Day: the new badass uniform. ;) I'm digging the two-button look! Thanks, Sara, my new uniform, I like that! Did you make the high rise skinniest or low rise stove pipe version? I made the low rise, adding 1" to the rise and then the other adjustments. Then the legs are a stove pipe. I love the whole ensemble. Black and white is such a classic combination. Those jeans fit you superbly! Great outfit and the jeans fit perfectly. Thanks, Sheila, I have a pair of denim ones cut out and ready to go. maybe this weekend. 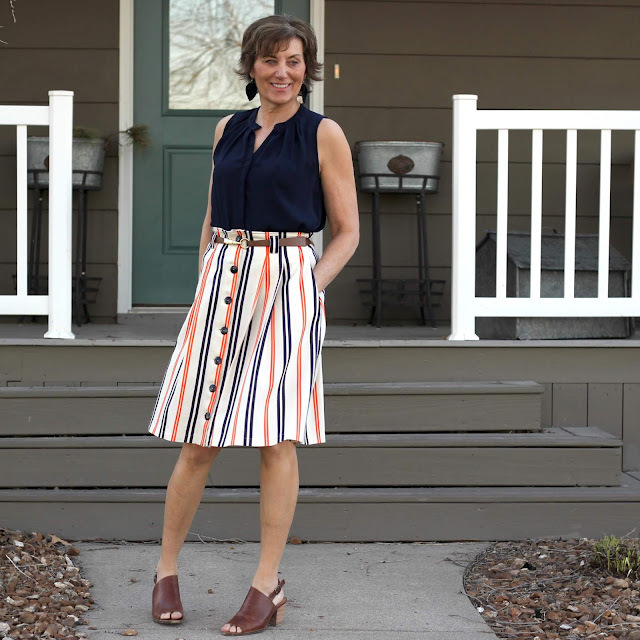 You should be thrilled with the entire outfit!! Fabulous!! Thanks, Margo, I do love it. Fantastic top you have done the clothing patterns perfectly.